Kallie Landry and HHS are unbeaten in district play. 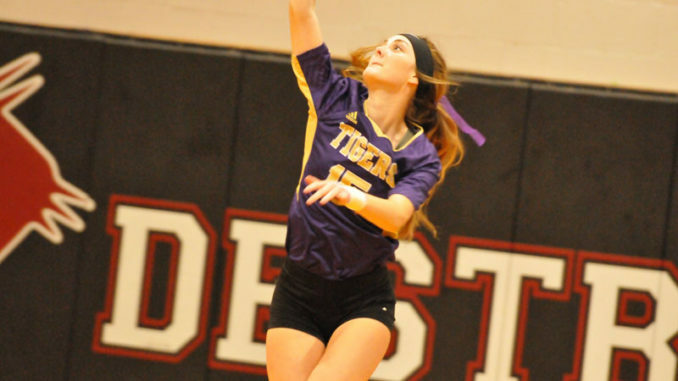 Hahnville kept its momentum rolling after last week’s pivotal victory over rival Destrehan, finishing the first round of District 6-1 play unbeaten after defeating Thibodaux in a three game sweep, 25-14, 25-21 and 25-17. Bailey Roux made 35 assists to help lead Hahnville (16-10, 5-0). Reagan Young made 11 kills in a spread out attack that also saw Yelah Moses and Brianna Plaisance each slam down nine kills, Chelsea Plaisance earn six and Kallie Landry four. Kristen Crutti and Roux each had eight digs while Chelsea Plaisance had seven. Landry served three aces. Much like against Destrehan, the points at the net were earned by a variety of hitters, something LeBoeuf believes makes her team tougher to defend. “We definitely want to spread it around because it makes it more difficult for the opposing team’s blockers to know where we’re going with it,” LeBoeuf said. Roux, the team’s setter, has been a major part of that effort. “She’s been doing a great job at keeping everyone involved and running our offense,” LeBoeuf said. Tonight (Oct. 11), Hahnville hosts Central Lafourche in the second game of the team’s second round of District 6-I play. The Tigers bested the Trojans in the first matchup between the teams in a three game sweep, 25-10, 25-10 and 25-18. Then the team will go on to enter tournament play at Lutcher on Saturday. The Tigers will face the tourney hosting Bulldogs and then face McGehee in pool play, both games Saturday morning, with the games beyond seeded by pool results. While Hahnville went unbeaten through a round of district play, the veteran coach says her team should expect a tougher go-round the second time through.